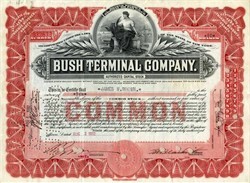 Beautiful certificate from the Bush Terminal Company issued in 1932. This historic document was printed by the Republic Bank Note Company and has an ornate border around it with a vignette of an allegorical figure. This item has the original signatures of the Company’s President, and Secretary, and is over 80 years old. Bush Terminal now known as Industry City is a historic intermodal shipping, warehousing, and manufacturing complex on the waterfront in the Greenwood Heights neighborhood of Brooklyn, New York City. Bush Terminal was the first facility of its kind in New York and the largest multi-tenant industrial property in the United States. The Bush Terminal Company managed the shipping for all of the Bush Terminal tenants making it the first American example of completely integrated manufacturing and warehousing, served by both rail and water transportation, under a unified management system. At its peak, Bush Terminal covered 200 acres (about 81 hectares), bounded by Upper New York Bay's Gowanus Bay to the west and north, by 3rd Avenue to the east, and—at its peak—between 27th Street, Brooklyn to the north and 50th Street to the south. Today, Industry City comprises roughly 40 acres of Bush Terminal, including 16 original buildings. The 6.5 million-square-foot complex is currently undergoing renovations to modernize the historic infrastructure in an effort to preserve the industrial heritage of the project for future generations of artisans, craftsmen and small businesses.